Welcome back bookworms!! I'm back with another Product review for you all! This is another Book Box Subscription that was sent to me to post on my Instagram, and I've decided to also have an honest review for you all, just to get a little more information on all of these new shops opening up!! 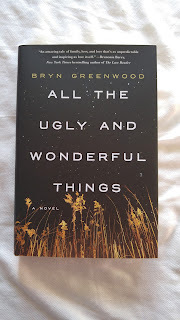 So without any more babbling, let's get to the review!! To give you a little more information on this new (ish) box subscription, let's break it down a bit. 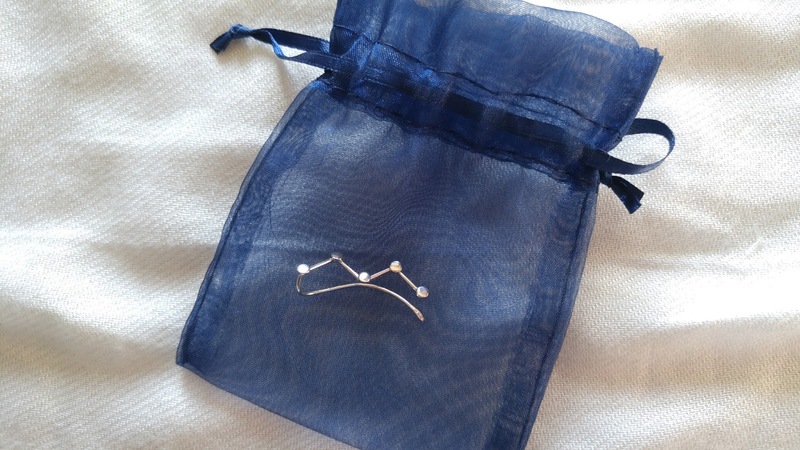 This is a Canadian made subscription box (YAY CANADA!!) 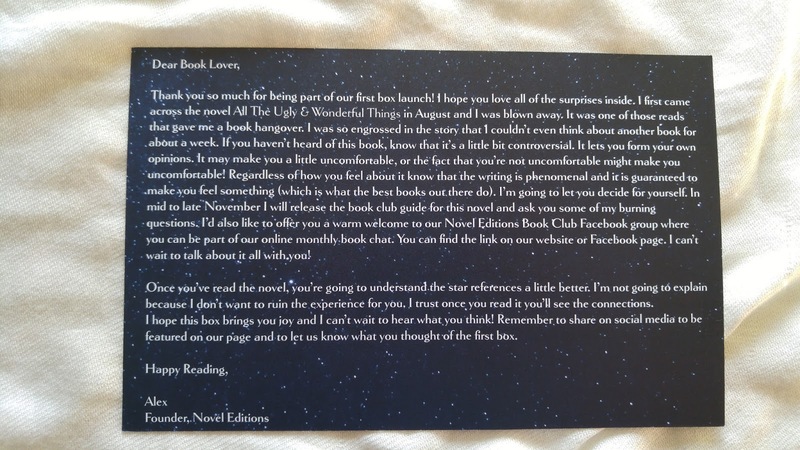 that packs a novel with 3-4 bookish items within it, and then a written letter explaining the reason for this box, book and items as well. Alex goes through a lot of books each month until there's a book that strikes her interest, and believes it should be shared with others! After you go through some of the amazing paper confetti (does anyone else love tearing through that?!) 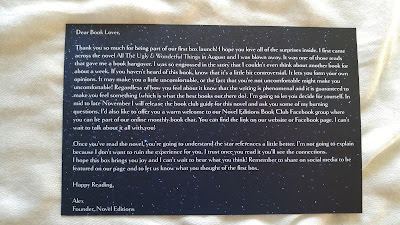 you'll see this card with the name of the theme on the front with a letter to each book lover which explains the reasons behind the month's theme. 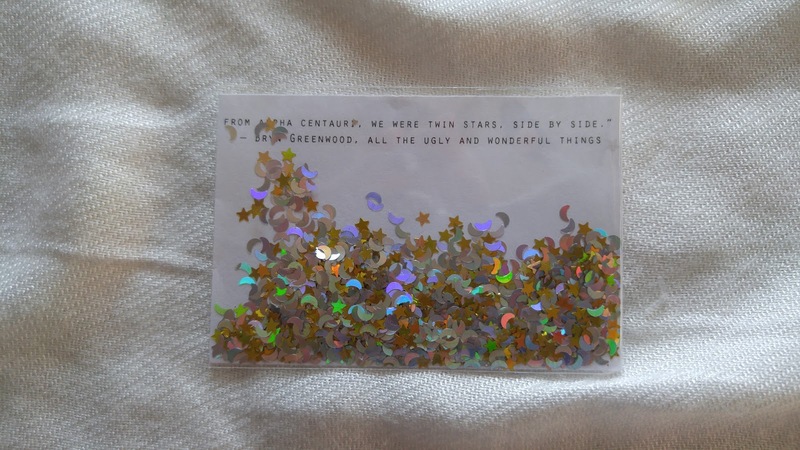 I really love how this has a letter to each of us, but it still hasn't spoiled anything to us, until we move more of that confetti out of the way towards the first item. I always try not to spoil myself, but it's so hard not to when everyone's posting photos! So after the letter, you finally get into the items from each box. 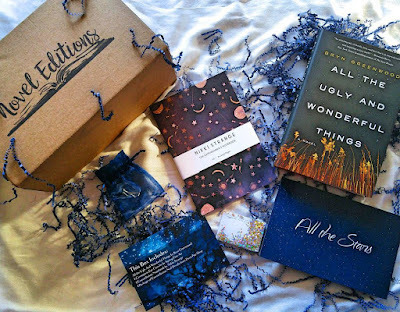 I am basing my review off November's box. 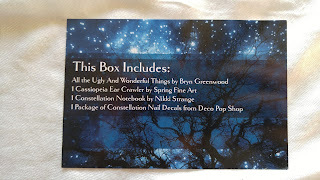 This is also her first box that Alex had created, but my review is still an honest opinion. 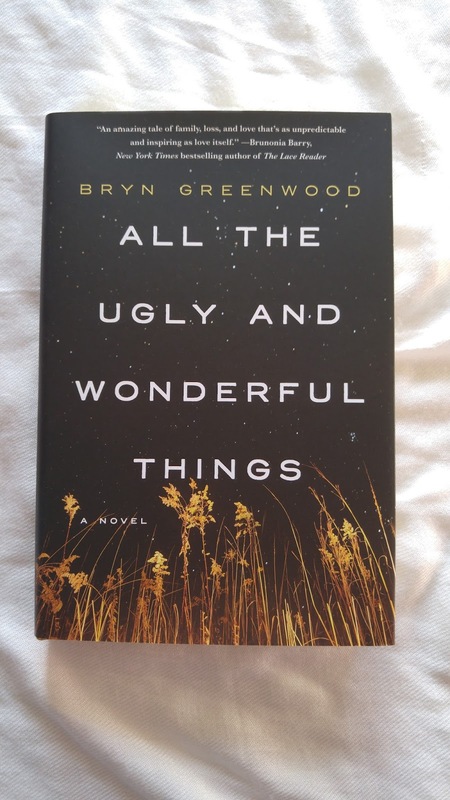 The book that was chosen was called All The Ugly And Wonderful Things. After that you get into the bookish items. 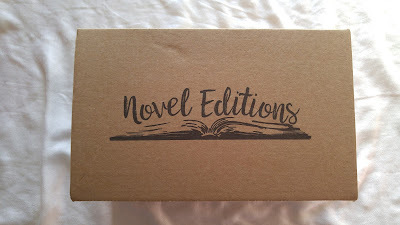 I personally am becoming more of a fan of the bookish items and book related items that come in subscriptions, that I almost prefer those over getting a new book! The first item is actually a silver Constellation earring cuff. It comes in the blue bag (Everything is colour coordinated as well which is sweet!) I really love the look of the cuff! Next in the box, I received a little package of constellation/ Stars and Moons confetti. I must admit, I wasn't expecting to receive some confetti in my box, and although I love the concept of it, I would have preferred something a little more. 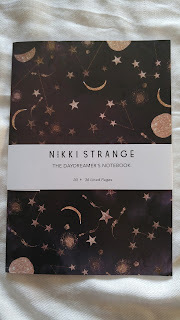 For the last item you'll receive in the box, I got a notebook with constellations as the cover. I personally LOVE the look of this notebook. It would have been nice if there were more pages within it, but it's a cute notebook you could store in your bag without it taking up too much space. 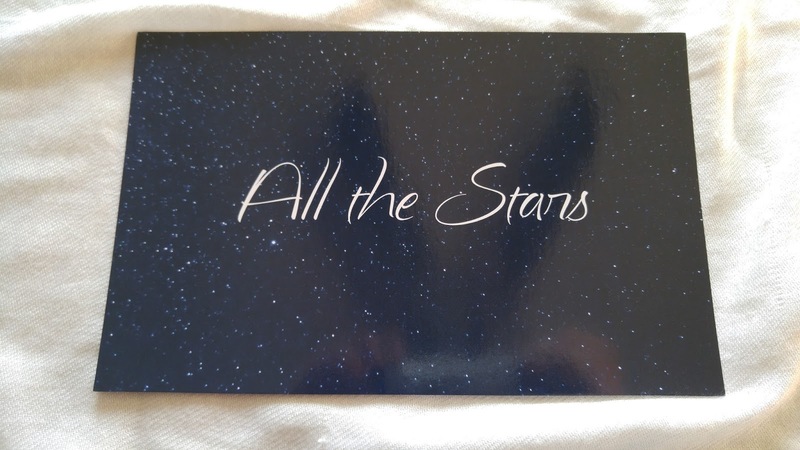 After all of this, and after you've opened up the book, you will have this little card inside with the book that tells you everything you've received in the box and who it was created by. Like I said, it is high in cost (about $60.00 CAD), and I personally feel like there could be more items in this box each month to make up for the costs. I do see on their website that you can purchase past boxes, some at cheaper prices than the original. Of course if you also subscribe to the box with a three or six month, you'll save some money there too. Alright, so if you're interested in supporting a Canadian shop and live in Canada, I would say head over to her shop here Also if you want to check out more amazing photos or sneak peaks, go and follow @Nerdyeditions on Twitter, Instagram, and Facebook you won't be disappointed! So many great sneak peaks and photos to see! !